What sets us apart from other engraving – awards companies is our Incredible customer service and attention to detail. We take the time to listen to our customers so that we may guide them in selecting the engraved awards, plaques, promotional items, badges and logo items that best suit their needs. We believe in treating our customers fairly and respectfully. It is a privilege to be able to work every day with our clients to help them create an incredible impression. And we have FUN along the way! Incredible Engravings, Inc. is not your typical awards engraving company. While we offer many of the same plaques and awards as our competitors, what makes us unique is that we excel at customer service and exceeding our client’s expectations. Taking our customers to the next INCREDIBLE level of awards and recognition is not only our motto, it’s our passion. We are not looking for just customers, we develop long term, lasting relationships to help our clients grow their businesses. Our engraving services include helping our clients select the perfect employee recognition rewards and customer appreciation awards at a price they can afford. We are your Engraving Specialists. Call us for ANYTHING you can put your name on! Setting up a booth at a trade show? 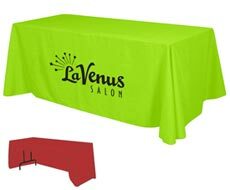 We can help with promotional products, table skirts and full color badges and more. Screen printed shirts, hats and more! Anything you can put your name on, we can do!